At the outset, Punjab government told the bench that it has not yet filed its response to Haryana's petition seeking compliance of the apex court's earlier order. 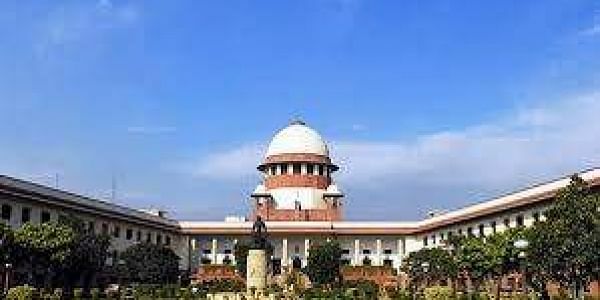 NEW DELHI: The Supreme Court today reacted sharply and rejected a Punjab government request for posting the hearing on the crucial Sutlej-Yamuna Link (SYL) canal dispute matter after the declaration of assembly poll results on March 11. "What is the use of courts waiting for election results," a bench comprising Justices P C Ghose and Amitava Roy observed after senior advocate Ram Jethmalani, appearing for Punjab, made the request. The bench then posted the matter for hearing on February 22. "Kindly keep it (the matter for hearing) after March 11. The election result will be announced on March 11," Jethmalani had said earlier. At the outset, Punjab government told the bench that it has not yet filed its response to Haryana's petition seeking compliance of the apex court's earlier order and that it will be filed soon. Jethmalani said they would also file a rejoinder to the reply filed by the Centre and sought time for it. The bench, which said that the interim order of status quo will continue till further order, asked Punjab to file the response by February 20. The apex court had earlier said that decrees passed in the SYL canal dispute between Punjab and Haryana cannot be flouted and directed both states to strictly implement its orders. It had on November 30 last year directed maintenance of status quo on SYL canal and appointed Union Home Secretary, Chief Secretary of Punjab and the Director-General of Police, Punjab as court receivers of the lands, works, property and portions of the canal. It had asked them to file a report with regard to the ground situation of the property. In November last year, the court had thwarted Punjab's attempt to wriggle out of SYL water sharing pact, saying it cannot "unilaterally" terminate it or legislate to "nullify" the verdict of the highest court. The court had issued a notice to Punjab on Haryana's plea seeking enforcement of the apex court verdicts and appointment of the receivers to ensure that the project land in Punjab remained intact. The controversial 1981 water-sharing agreement came into being after Haryana was carved out of Punjab in 1966. For effective allocation of water, SYL canal link was conceptualised and both the states were required to construct their portions within their territories. Haryana constructed the portion of SYL canal in its territory. However, Punjab after initial work, stopped the work, leading to the spate of litigations. In 2004, the Congress government of the state came out with the Punjab Termination of Agreement Act with an intention to terminate the 1981 agreement and all other pacts relating to sharing of waters of rivers Ravi and Beas. The apex court had first decreed the suit of Haryana in 2002 asking Punjab to honour its commitments with regard to water sharing in the case. Punjab challenged the verdict by filing an original suit which was rejected in 2004 by the Supreme Court which asked the Centre to take over the remaining infrastructural work of the SYL canal project.